Hi-Tech helps engineering clients in simulating burner behavior with a particular furnace design through Computational Fluid Dynamics (CFD) analyses. 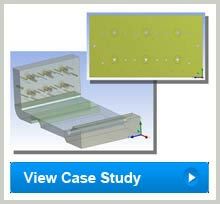 We assist in optimizing burner design to prevent potential problems ahead of the actual prototype studies, thereby eliminating the on-site trial and error methodologies at test site. Our CFD solutions are aimed to throw insights in to the intricate details involving fluid flow, heat transfer and related phenomena such as chemical reactions on which design problems can be diagnosed, optimized and re-developed. CFD has matured to a point where predictions of performance are made from models, covering different aspects such as complex furnace reaction and burner analysis. These aspects allow engineers to explore various design parameters previously considered expensive or even impossible. Our CFD analyses are particularly useful in observing flame propagation, burner near field aero dynamics, understanding chemical reactions and measuring high temperatures and pressures. Our engineers also analyze air flow distribution to each burner in forced draft application to ensure if the burner is receiving proper air content, how the ductwork and plenum are supplying air and make decisions to determine any design modifications requirement to the distribution itself.